Founded in 1966 by five Swedish churches; regional office for the Middle East is located in Jerusalem. According to NGO Monitor research, Diakonia has been issued a humanitarian visa for its work in Israel. In 2017, total revenue was SEK 506.5 million; total expenses were SEK 499.2 million, of which SEK 51.7 million was spent in the Middle East. In 2016–2017, Diakonia’s International Humanitarian Law (IHL) Resource Centre received $2.2 million from Sweden, Switzerland, and the Netherlands. Sweden committed SEK 5 million (2017). The Swiss Agency for Development and Cooperation (SDC/EDA) committed CHF 1.7 million (2017-2019). The Dutch Ministry of Foreign Affairs committed €250,000 (2017-2019). In April 2017, Diakonia hosted a seminar titled “50 Years of Occupation: Civil society in Israel and Palestine working for change.” The seminar featured Ran Goldstein, Executive Director of Physicians for Human Rights- Israel (PHR-I), and Mahmoud Abu Rahma, Communications & International Relations Director of Al Mezan. “Any jus ad bellum claim Israel might make, to be acting in self-defence, is undermined by the fact that the acts to which it is claiming to respond to in self-defence, i.e. the on-going missile attacks by Hamas, are not confined to the immediate period before Israeli military incursions, indicating that the choice of entering Gaza by force is one exercised by an occupier, deciding when to reassert authority, rather than as a state responding to existential threats against it” (p. 12, emphases added). “GoI claims that building materials are ‘dual use’ and may be used to rebuild the ‘terror’ tunnels from Gaza into Israel but, assuming that fear to be well-founded, it would only allow it to restrict those supplies that it has ‘serious reason’ to believe will be used in this way” (p. 13, emphases added). While disregarding the deliberate targeting of civilians by Hamas, the opinion insinuates Israeli ulterior motives to abuse the GRM to arbitrarily target civilians in Gaza, claiming that “There is strong evidence of the connection between the GRM and actual and potential violations of core human rights (for example, the right to housing especially in conjunction with the right to life, and the right to life in terms of potential misuse of the database by the GoI for the identification of targets)” (p. 11, emphases added). During the 2014 Gaza War, Diakonia published a statement (July 13, 2014) accusing Israel of “collective punishment,” “war crimes,” and “violations of international humanitarian law (IHL),” while ignoring Hamas terror attacks against Israeli civilians and Israel’s legitimate right to self-defense. Diakonia Policy Advisor Joakim Wohlfeil posted a message on Twitter stating: “The outside world must stop Israel’s violations of international law and the constant oppression of the Palestinians” (July 24, 2014). Sponsored a March 2011 exhibit at the Army Museum in Stockholm featuring Israeli NGO Breaking the Silence (BtS). During an interview, BtS representative Itamar Shapira stated: “We are the oppressors, we are the ones that are violating human rights on a daily basis. We are creating the terror against us, basically… This is a war against civilians, a war against society” (emphasis added). Diakonia’s “International Humanitarian Law” (IHL) program, which has its own online “Resource Centre,” focuses exclusively on Israel, alleging Israeli violations and impunity. Diakonia does not conduct similar types of programs in terms of content or resources involving any other conflict region in the world. 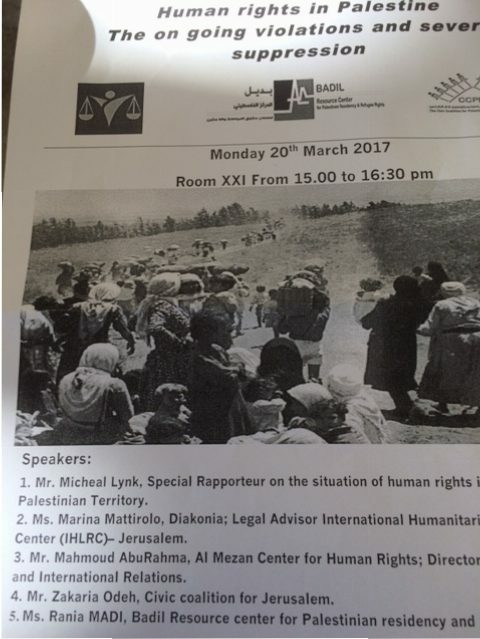 In March 2017, Diakonia-IHL Center participated in a side event at the UNHRC titled “Human Rights in Palestine: The ongoing violations and severe suppression” featuring Rania Madi (BADIL), Mahmoud Abu Rahma (Al Mezan), and Michael Lynk (UN Special Rapporteur “on the situation of human rights in the Palestinian Territory occupied since 1967”). Diakonia is a member of the Swedish branch of Ecumenical Accompaniment Programme in Palestine and Israel(EAPPI). “Partners” with a number highly biased and politicized NGOs active in the Arab-Israeli conflict, including: DanChurchAid, Palestinian Medical Relief Society, Women’s Affairs Technical Committee, Sabeel, Physicians for Human Rights – Israel, BADIL, Al-Haq, B’Tselem, Al-Mezan, Kerem Navot, Society of St. Yves, Gisha, and Who Profits. 2015-2016 figures based on NGO annual reports, 2017-2018 figures based on quarterly reports submitted to the Israeli Registrar for Non-Profits.